Jazz House Kids concerts, assemblies and workshops bring students concise, entertaining and exciting introductions to jazz – not just the music, but also its history, culture and place in America’s story. Take a look here at what’s available, and feel free to consult us about which program is best suited to your school or class. Creative adventure and a stomping good time are in store for the young participants in this workshop series! The acclaimed assembly program includes two exciting multimedia presentations examining the musical, historical, geographic, social and cultural influences that form the foundation of jazz and solidify its importance in America and around the globe. A professional jazz ensemble conducts each assembly program using an interactive approach that includes an informative video as its backdrop. Special needs and physically challenged students are able to participate fully in the programs. Grab your tool belt because it takes everyone to build this house! This first session lays the foundation for hearing and recognizing jazz music. Students construct a virtual Jazz House using their voice as a tool and explore the basic function and unique roles of each instrument. Students learn the importance of a strong skill set for individual development and the satisfaction derived from group collaboration. A lively, specially arranged musical repertoire ensures that students exploration into jazz is memorable! What are the blues? Why do we get them? And how can we shake them off? This second session introduces the universally recognized language of the blues, the foundation of virtually every form of contemporary American music. The historical, cultural and social legacies of this musical journey unfold as students examine the basic chord structure, rhythm and emotional storytelling inherent in the music. Their creative spirit comes alive when they collaborate on and perform their own Blues story. Looking for an exciting, engaging way to introduce your upper elementary-to-high school students to jazz? A Jazz House Kids faculty ensemble will open students’ ears to this original American art form. Our instructors – all professional musicians – weave into their performances lessons about jazz instruments, audience protocol, and the music’s history while they swing and swap stories. Your students will leave with their heads full of jazz styles, important composers and preeminent artists. Concerts may cover general jazz history, specific eras, or individual artists such as Nina Simone or Thelonious Monk. When requested, we’ll work with a teacher or administrator to tie a presentation to a given lesson plan or an event such as Black History Month or Women’s History Month. A typical ensemble includes a rhythm section, trumpet or saxophone player, and, when feasible, Jazz House Kids founder Melissa Walker on vocals. 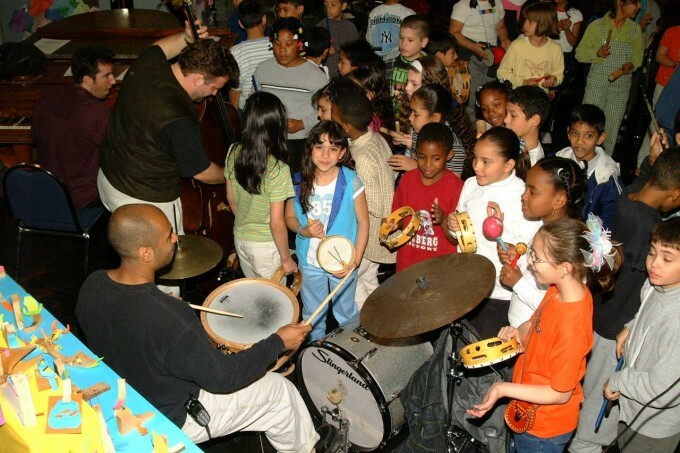 To book a Jazz House Kids in-school concert, contact our Education Department at info@jazzhousekids.org or 973-744-2273.